In February 2009 Judy Watson was appointed artist-in-residence at The University of Queensland’s Heron Island Research Station. Watson’s daily walking excursions around the Island produced a collection of material for visual research including coral forms, feathers, vegetation and sea pods. Drawing studies were made from these materials which formed the basis of the etchings in the Heron Island Suite. This exhibition is courtesy of Judy Watson and grahame galleries + editions, Brisbane. 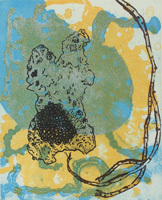 Image: Judy Watson, #4 (detail) 2009/2010, etching from 3 zinc plates and screenprint: plate 1 warm yellow ochre; plate 2 transparent blue; plate 3 black and brown à la poupée; screenprint white. Courtesy of the artist and grahame galleries + editions. Photography by Carl Warner.